This unique chicken lasagna is made with layers of lasagna noodles, green tomatillo salsa and tomato salsa, cilantro, Mexican cheese, spinach, diced tomatoes, and cooked chicken. The Tex-Mex flavors make this delicious lasagna an extra-special meal your family will ask for again. To cut down on prep time, cook the chicken a day in advance or purchase a rotisserie chicken or fully cooked chicken strips. In a large skillet, heat the olive oil over medium heat. Carefully slice each chicken breast into thinner cutlets or strips. Sprinkle with salt, pepper, and chili powder and then saute the chicken in the hot oil, turning frequently, until cooked through about 8 to 10 minutes. Chop the chicken and set aside. In a medium saucepan, heat butter over medium-low heat. Add the flour and cook, stirring, for 2 minutes. Add the milk and tomatillo salsa and cook, stirring, until thickened. Stir in the green onions, cilantro, and cheese. Taste and add salt and pepper, as needed. Spread about half of the chunky salsa in a 9-by-13-by-2-inch baking pan. Lay 3 lasagna noodles side-by-side over the salsa layer. 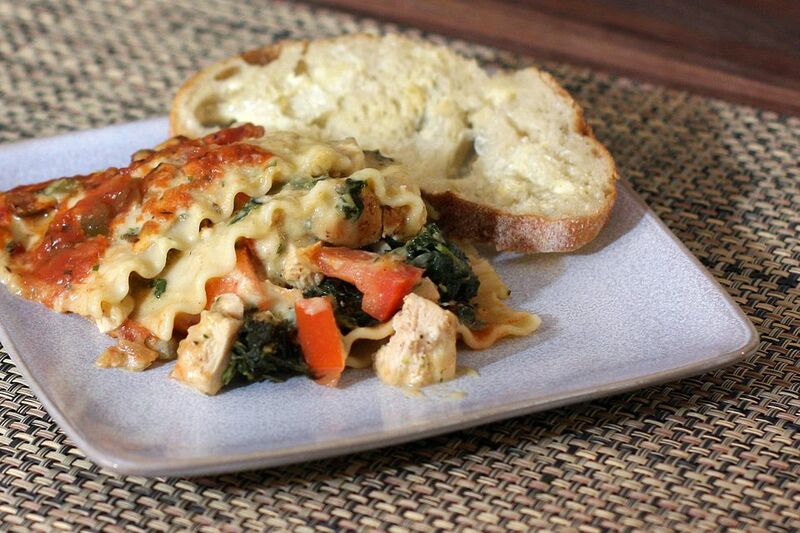 Top the lasagna noodles with half of the spinach, half of the cooked chicken, and half of the diced tomatoes. Spread with about 1 cup of the cheese sauce mixture. Repeat with 3 more noodles, the remaining spinach, the remaining chicken, and the remaining tomatoes. Spread with another 1 cup of the cheese sauce mixture. Top with the remaining noodles and then spread with the remaining chunky salsa and the remaining cheese sauce mixture. Cover with foil and bake for 30 minutes. Remove the foil and bake for 10 to 15 minutes longer. Did You Know You Can Make Lasagna in Your Crockpot?